The Fall season is slowly creeping in on us and we can't help but feel excited for the holidays. Next month, there's Halloween and soon enough, Thanksgiving will also be just around the corner. 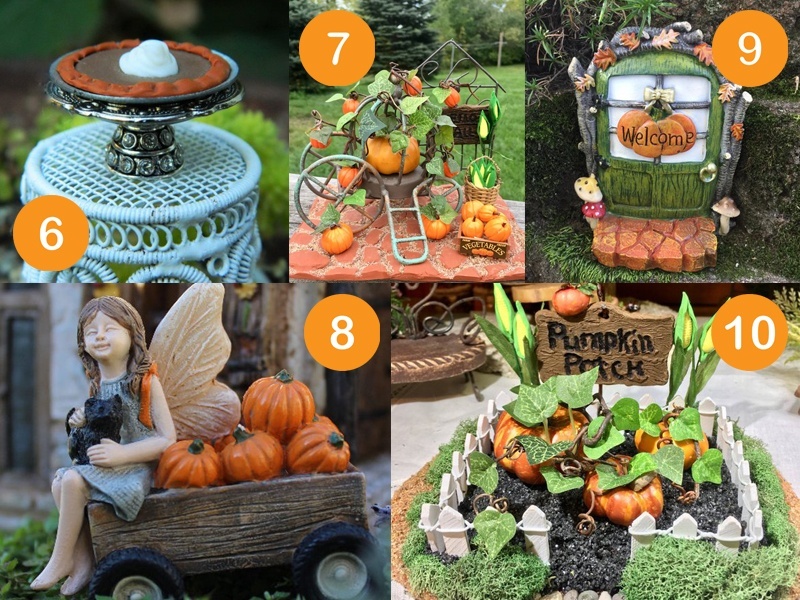 But before we think of all those celebrations, let's check out the fall fairy garden accessories that will make the season even more exciting, especially for our fairy friends! The turkey is very symbolic of Thanksgiving and the Fall season. After all, the turkey is always the centerpiece of any Thanksgiving celebration. This very healthy turkey is standing beside a pumpkin, which is also a Thanksgiving staple! One of the most exciting things about Fall is seeing the leaves of the trees turn different shades of orange and brown. When they fall down, fairies will gather them up using this rake and burlap bag. Check out the whimsical miniature leaves that you can scatter across your fairy garden! Meet the fairy Claire, who is super ready to celebrate Halloween! She is dressed in her Sunday best, an orange ensemble completed by a black witch's hat and a broom! She also has monarch butterfly wings that match her outfit. Who's ready to go Trick or Treating? These scarecrows are not scary at all! In fact, they're the friendliest scarecrows who make sure that the harvest stays safe from all the bugs and pests. They're also welcoming of fairies who bless the harvest with their magic. This young boy is ready for the harvest season! Little fairy boy Jacob is comfortably seated on a hay bale and holding a pumpkin from the pumpkin patch! Fall would never be complete without some pumpkin pie! Let your fairy friends enjoy this sweet pumpkin pie baked from the finest pumpkins from his season's harvest. This rustic little wagon is a whimsical addition to your fall fairy garden. It features a cute little sign that reads “Hello Fall,” with lots of pumpkins and corn, as well as some vines crawling all over the wagon. There's also a crate of freshly harvested pumpkins. Look how bright and orange they are! So delicious! This gentle fairy is sitting on a wheelbarrow that's been loaded with newly harvested pumpkins! She's also holding her best friend, a black cat. She's waiting to go Trick or Treating with her other friends. We can't wait! Look at this gorgeous harvest that the fairies have been working on throughout the year! All their hard work has been rewarded with this beautiful harvest of pumpkins and corn. This delicate pumpkin patch is guarded by a quaint white picket fence and a cobblestone entry. It also features a sandy terrain and moss surrounding the picket fence. Fairy doors are always a magical addition to any fairy garden. This one has a Fall/Autumn theme, with golden/orange leaves surrounding the frame and a cute little pumpkin sign that reads, “Welcome.” Aside from its beautiful Fall colors, it also has some mushrooms at the base and a cute little golden door knob. 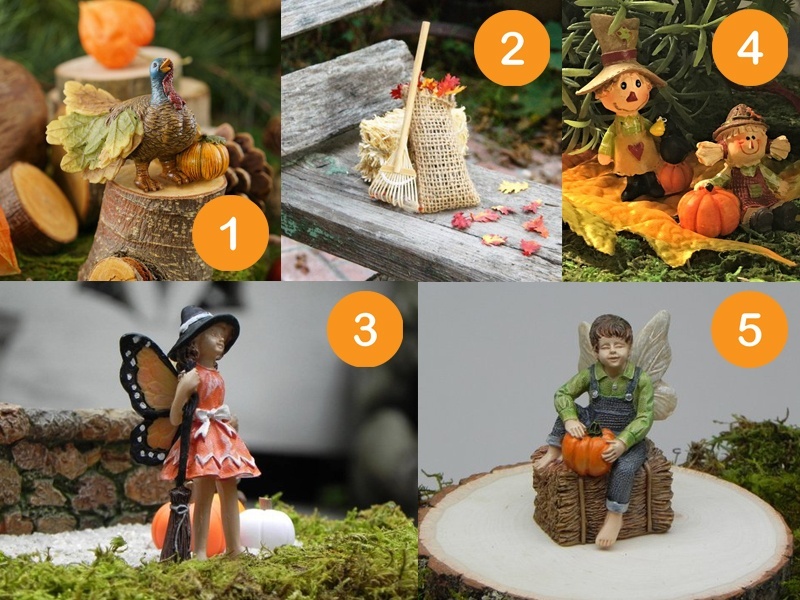 Enjoy the magic of Fall fairy garden accessories with these and more items we'll feature in the blog this month leading up to Halloween and Thanksgiving. Don't forget to bookmark Teelie's Fairy Garden for the latest in all things fairy garden and check out the next story below!